I have been working on my old 1999 TJ Jeep and I always wanted to have Bluetooth connectivity in for the stereo. I could have bought an after market head unit but I never really liked the look of them and they tend to be easily stolen out of the Jeep (softtop!). The stock head unit matches the dash and is less likely to be taken. 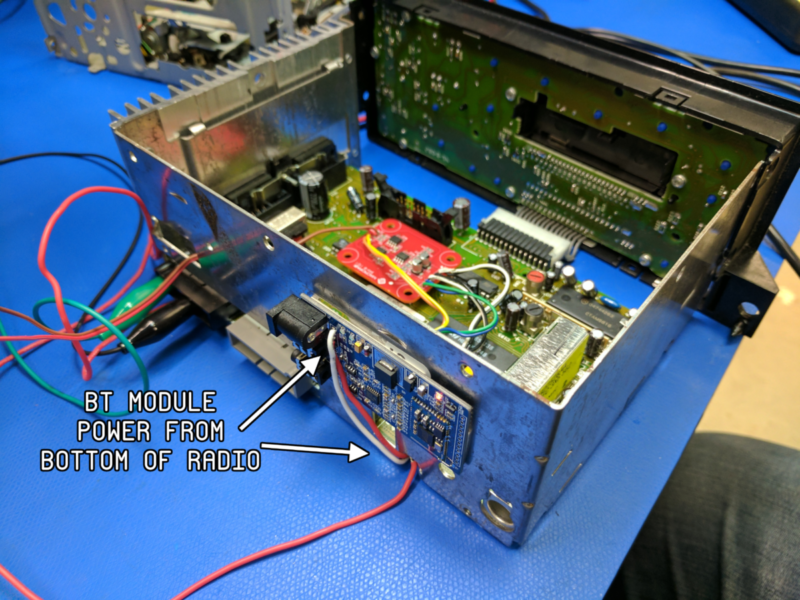 Thus the solution was to hack in a Bluetooth module into the radio! First I bought a used radio on ebay. Part number for the radio was P56038933AB and I was able to pick one up for $25 as I wanted to keep my radio functional in the Jeep till I got the Bluetooth working. Then I picked this module on amazon. 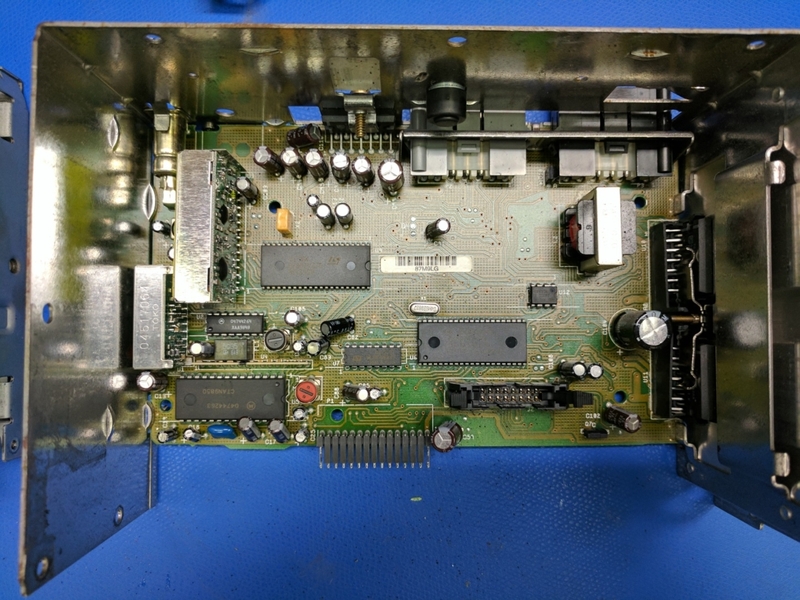 I chose this module as it had a wide input voltage, every single connection and signal was brought out to a header, and it had good reviews. Next I opened the radio. It had T15 Torx (jeep thing :| ) machine screws that held it all together. 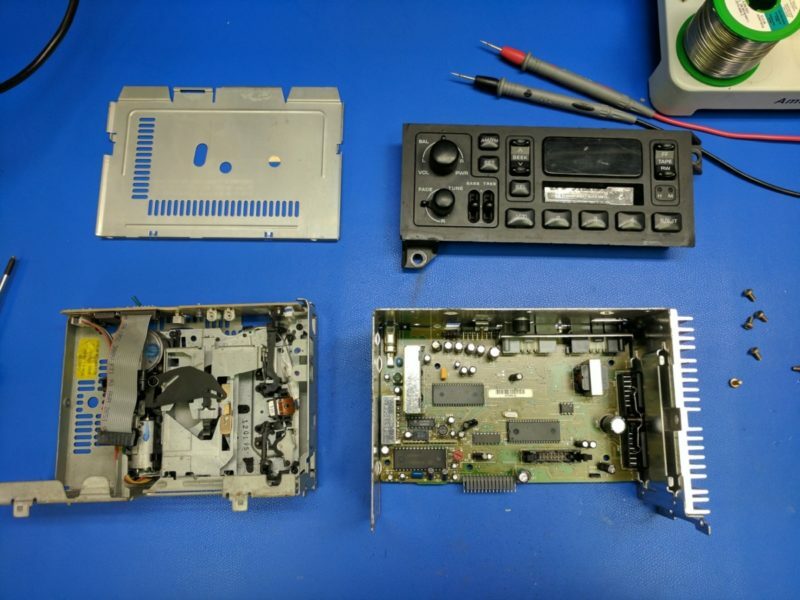 Took it apart all the way to the bare radio. Next to figure out how to get the Bluetooth signal injected into the radio! Most people that do these kind of hacks just blindly poke around the radio till they find and audio signal and then inject there. This is fine but I wanted to make sure I was getting the best audio quality out of my cheap Bluetooth module and early 90’s designed, base model head unit. I also wanted to keep the volume knob on the radio functional. This meant injecting the Bluetooth signal in the circuit before the power amplifiers and before it was gained for volume. To figure out where to inject the audio. I first wrote down all the IC Manufactures, Part numbers, and Package size. Clicking the links will show an image of the IC. Next I started searching for stuff like “ST Audio DIP42” into google. After finding promising datasheets, I then verified their pinouts buy tracing the power and ground sources in the radio. Here is the cross reference of what I was able to find. I also found this interesting PDF which is a early 90’s listing for ST Micro parts. 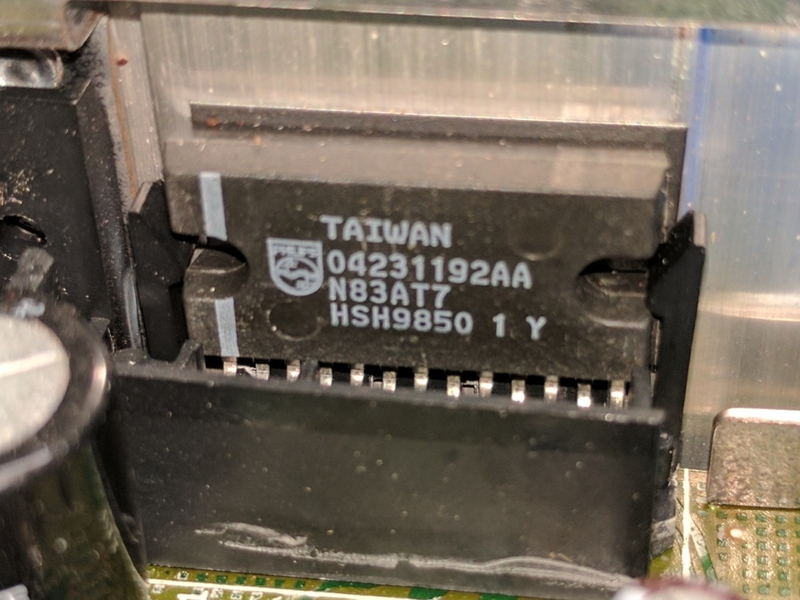 I was able to find the TDA7340S IC with it. The IC that does the sound muxing, volume, and tone control is the TDA7340S and I figured this would be the best place to inject the Bluetooth audio signal. Above is the block diagram. After the audio mux the signal travels to an external effects loop which consists of in series 1uF electrolytic capacitors. Then the audio signal travels into the volume and tone control parts. Perfect! If I inject the audio right before the capacitors I will retain the volume and tone control of the radio. I thought about using the unused PHONE IN and then using a MCU to sniff the I2C buss and inject the right commands to switch it to that input but figured that would be more work then just injecting in the effects loop. The next part is to make sure the signal from the Bluetooth adapter is compatible with what the TDA7340S is expecting. At max volume on my phone the Bluetooth adapter outputs a ~50mV DC offset signal with a ~1.7V to ~1.9V Pk-Pk. The signal in the effects loop was 4.65V DC offset signal with a 800mV Pk-Pk. Bluetooth Module output at max volume. Output of the TDA7340S effects loop. This would need to be matched to ensure compatibility. Since these signals are different I needed to adjust the signal of the Bluetooth adapter. 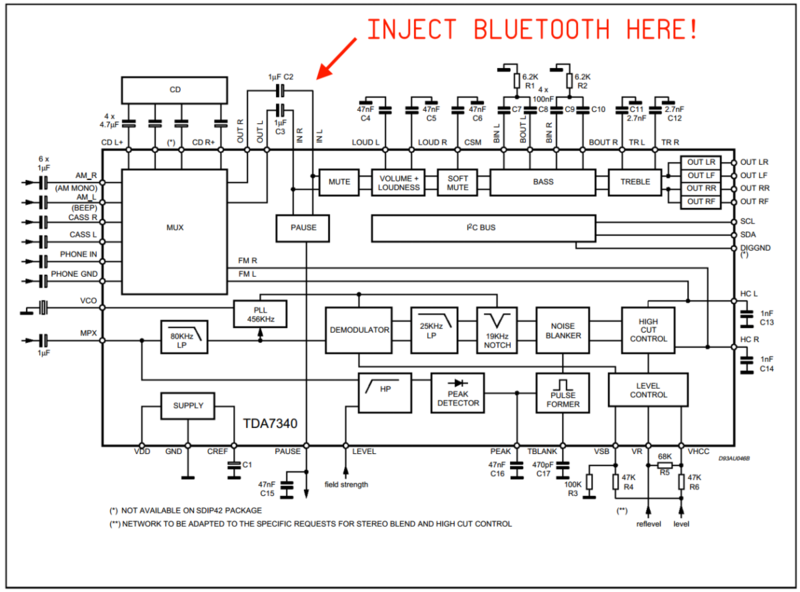 I would need to apply a DC offset and then negative gain the signal from the Bluetooth signal. The opamp circuit below should do the trick. 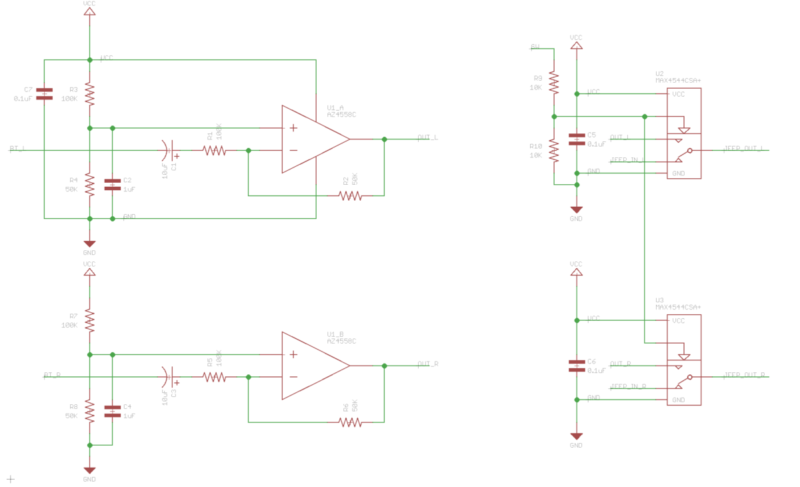 The feedback circuit is set to half gain and by applying half of VCC (via a voltage divider) to the other input of the opamp we can DC offset the signal. I tested it by having my phone play a tone via a tone generator app called “Frequency Sound Generator”. Signal below. The input is in red and the output is in yellow. Signal now matches closely to what the TDA7340S expects their to be in the effects loop! 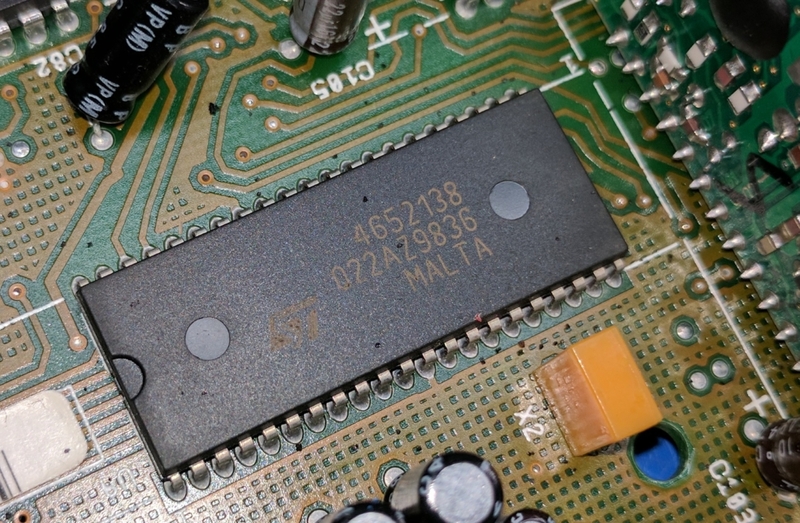 Then to switch between the TDA7340S signal and the Bluetooth signal I found an analog switch IC made by Maxim, MAX4544CSA+. The opamp I decided to use was a AZ4558C. I decided to use it because it is a decent audio amp and fairly inexpensive. Lastly, since its stereo we need to double everything. 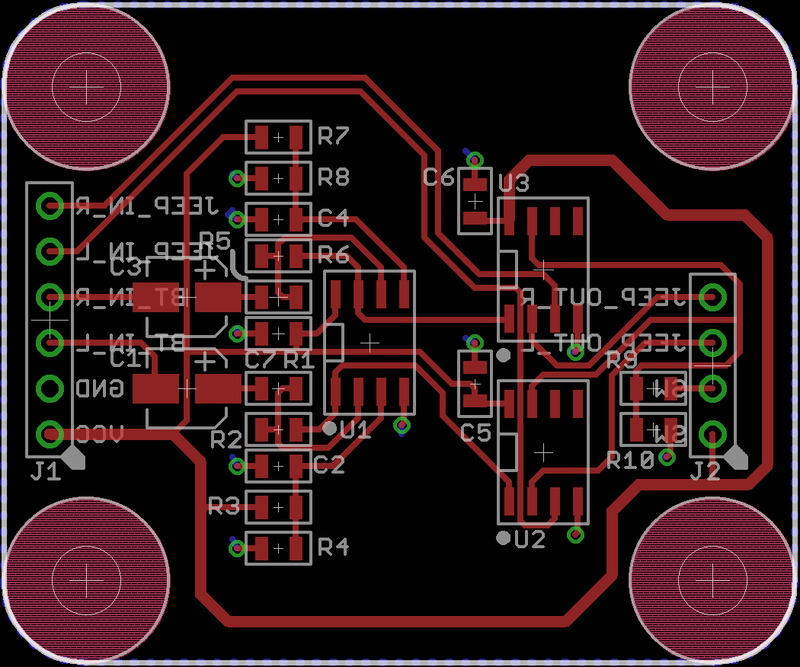 Below is the schematic and layout I did in Eagle. The files for the board can be found on my github. I uploaded the files to MacroFab and ordered the board. I then soldered the board into the radio. 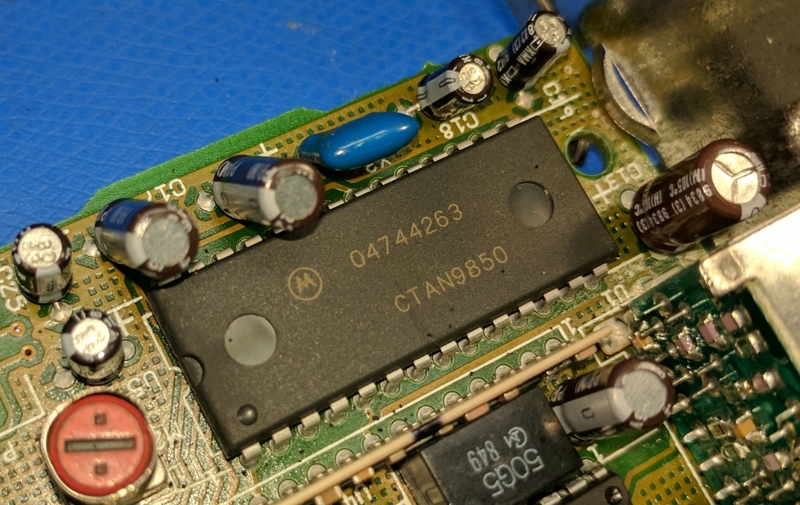 I desoldered one leg of the the effects loop 1uF caps which are designators C112 and C113, then soldered hook up wire on the legs of the capacitors and into the hole in the PCB. 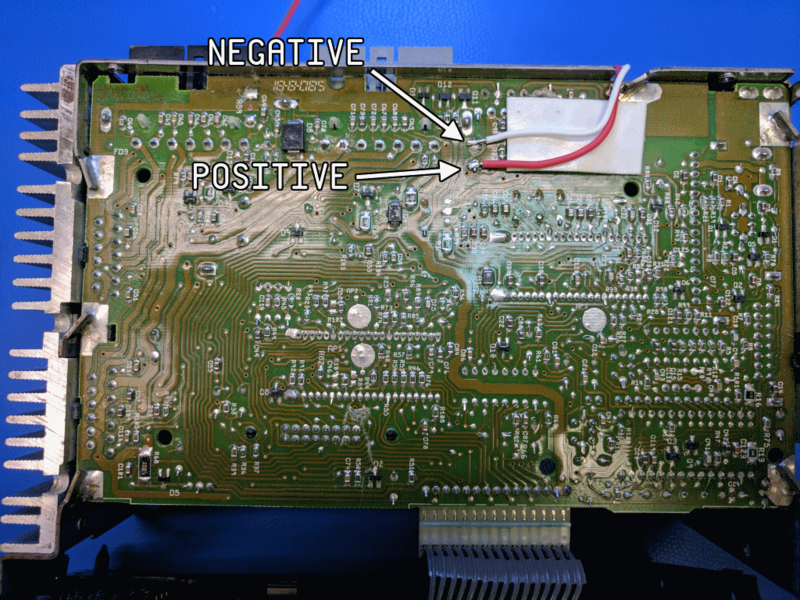 The power for the Bluetooth module is pulled from the bottom of the radio. 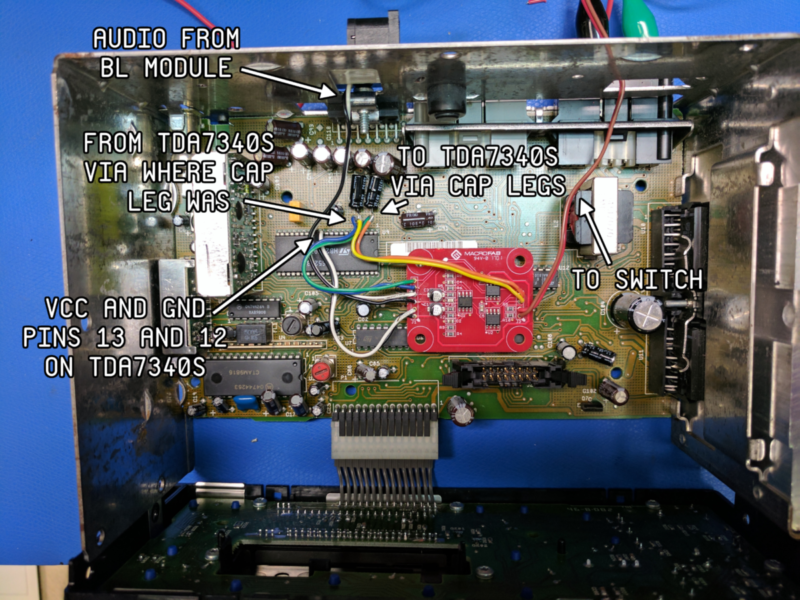 To switch the audio from the TDA7340S to the Bluetooth the input of the MAX4544CSA+ is pulled up. A switch on the dash will be used for this. See image below for how everything is hooked up. Power for the Bluetooth module. Then I tested the radio and made a video. And then installed it into the Jeep! 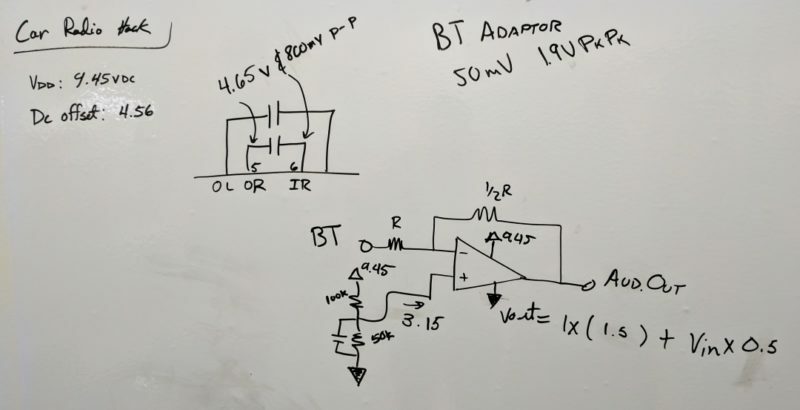 I did something very similar in my car audio, but found a problem that when audio volume in var was set louder (not loud, but let’s say 40%) AND BT module was not connected, or just was not playing anything, you could hear “power supply” noises . Of course when music appeared, it was not noticeable , but annoying anyway. Nice, I have the same exact deck in my neon, I may have to do this. Thanks so much for this tutorial! I recently added an aux port to a ford pioneer radio and wanted to do the same to my dodge intrepid. The pioneer was a straight forward job as there was a r and l output directly from the tuner. The dodge, however, used mpx output. My radio uses a 28pin chip audio processor made by ST. With this tutorial I was able to locate the oit puts and capacitors (although in my case they are smd caps.) Tests have been successful tapping into this circuit and I will be completing the project tonight. Correction.. chip is a TDA7461N. very nice!! 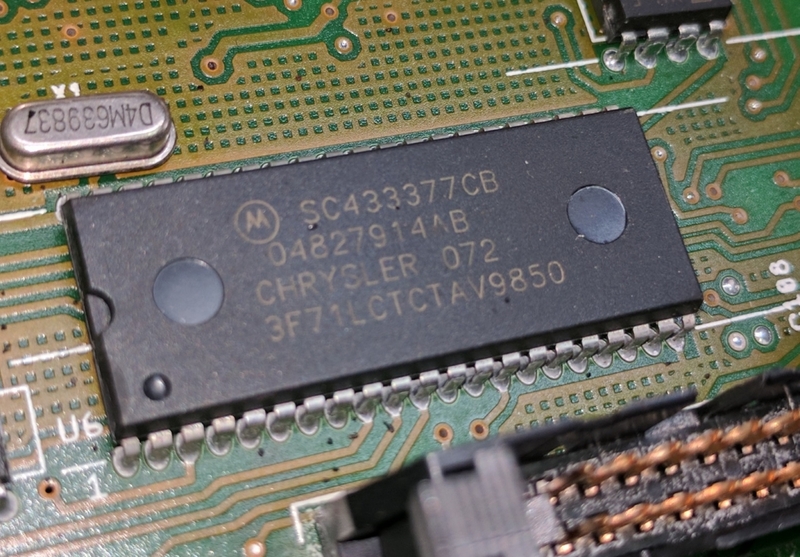 i am hacking an OEM chrysler deck(p56038933ab) for portable 4channel aux/bluetooth capable box. All th live long day!! !